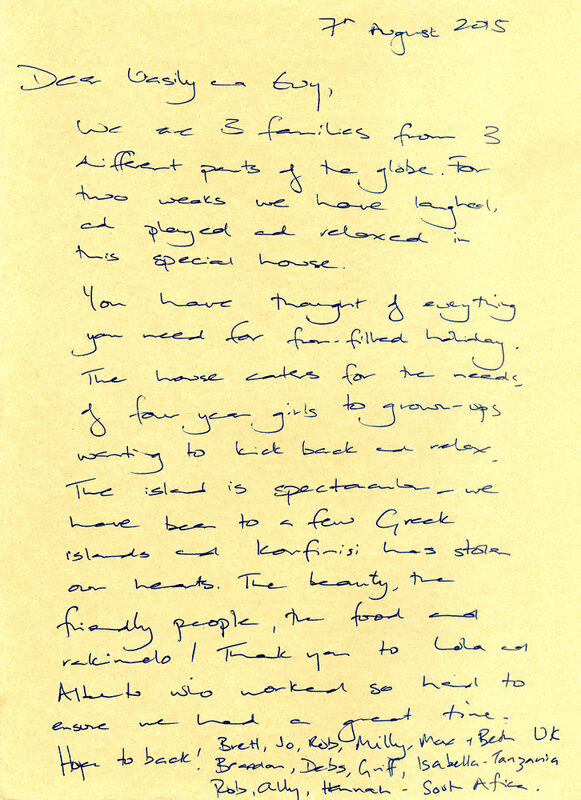 Thirteen of us from one large family stayed very comfortably in the two houses at Fanis’s property on a secluded hill top, a short (10 min) walk from town and beaches. The houses are kept immaculate - there is not a sign of wear anywhere. Plus the couple who come every day to service the houses are meticulous and discreet. It was very helpful to have the use of two vehicles to shuttle us about when hot or tired (or both). We employed the services of a chef from Athens called Tasos who was simply amazing - his help with all aspects of the catering (shopping, cooking, serving etc.) made our 14 nights even more relaxing and luxurious. The 2-part pool was very popular with all the children and adults. There are lots of chill out areas which can be enjoyed as a group or individually. The gardens are beautifully designed and maintained. We all got lots of sleep in air conditioned bedrooms and most of us benefited from en-suite. There is a strong breeze that blows across the island from time to time but this at least helped keep things cooler, and we got accustomed to it. Koufonissi is a small island and there are only a small number of beaches and services but we still found plenty to do over two weeks given that we took a very relaxed approach to every day! Would recommend this property without hesitation. May I take this opportunity of complimenting you and your family and your staff on making available to us the most amazingly comfortable, beautiful, well positioned and organised villas that we have ever stayed in. So much thought has gone into this property that it is sometimes hard for believe. The poolside bar, the wonderful barbeques, the well-equipped basements, and perhaps above all the strategic seating. It does not matter what time of the day it is there is always a place to sit in the shade and look out across the town and the blue Mediterranean. It really was the holiday of a lifetime for us all. Thank you once again and let me say how much I appreciate coming across people who do things so well. Best of luck going forward and who knows you may see us back again :-). On behalf of us all warm regards for now. This was a return visit for one family member and it fully lived up to all expectations from the time we were met off the ferry by our charming hostess Evy until we were farewelled by Evy and Vassili. A superb house, pool and grounds with a car at our disposal. The charm of Koufonisi is its relatively small size and smaller tourist numbers giving a sense of ownership of space. Nice restaurants, good swimming and in fact one could happily stay around the pool all day. Would love to come again. Cunningham family, Auckland. 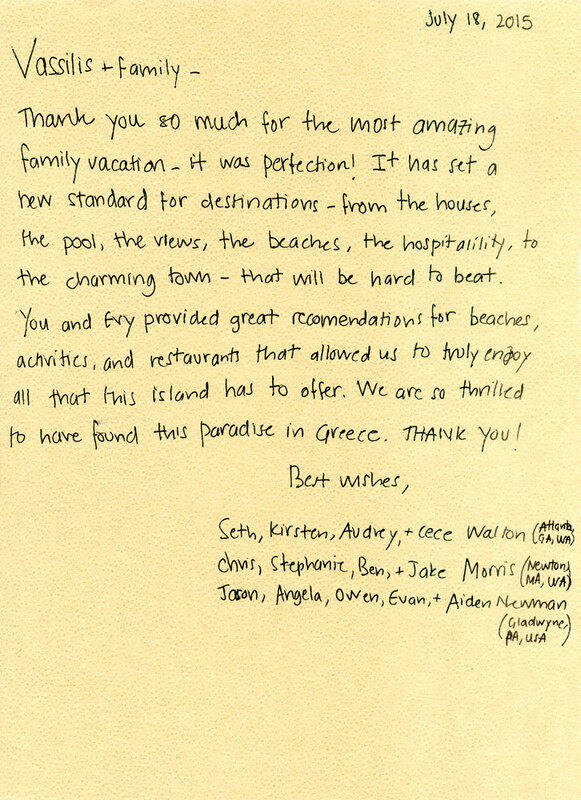 We have recently returned from a terrific two week vacation at Villa St Astra. We were a large group, 15 people in all, and the property worked exceptionally well. Koufonisi is a gem of the Aegean. Small, difficult to get to, but with a unique charm and old world feel. Perfect for families although dining and nightlife options were wider than we anticipated. Almost everywhere we went represented good value and the locals were welcoming and helpful. The houses themselves are in excellent repair and the hosts, Vasili and Evy, are more than willing to go the extra mile to ensure your stay is stress free and comfortable. Having spent several summers in the Ionian, we are now converts to the Aegean and really can't recommend this island, and this property in particular, more highly. Owner's Response: Dear Brett, Thank you very much for this lovely review. 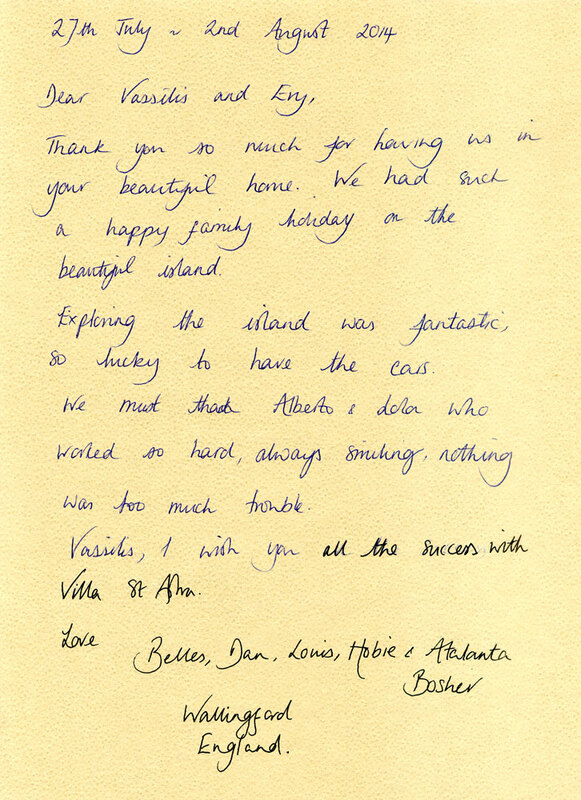 We are very happy you liked villas and our services so much . This gives us the strength to try to become better . We wish you a great autumn season and expect hopefully to see you again next summer! Our stay in Koufonissi was the trip of a lifetime, made possible not only by the villas Belus and Agenor but by their owners. Vassili and his wife Evy truly saw to every detail, not just in the homes but on our entire trip. We were picked up and taken to the port for travel, they arranged our boat tour with the famous captain Prassinos, they provided us TWO cars for use during our stay (what other rental property does that? ), they made sure we knew where to go for a birthday cake for our son, and they provided recommendations on where to eat and where to purchase fresh fish. The caretakers of the home, a lovely couple, could not have been more wonderful and made sure that we truly didn't lift a finger during our time there. We hired a professional chef and Tasos made our stay just perfect! His food was truly amazing, and his ability to cater to 13 guests was unmatched. 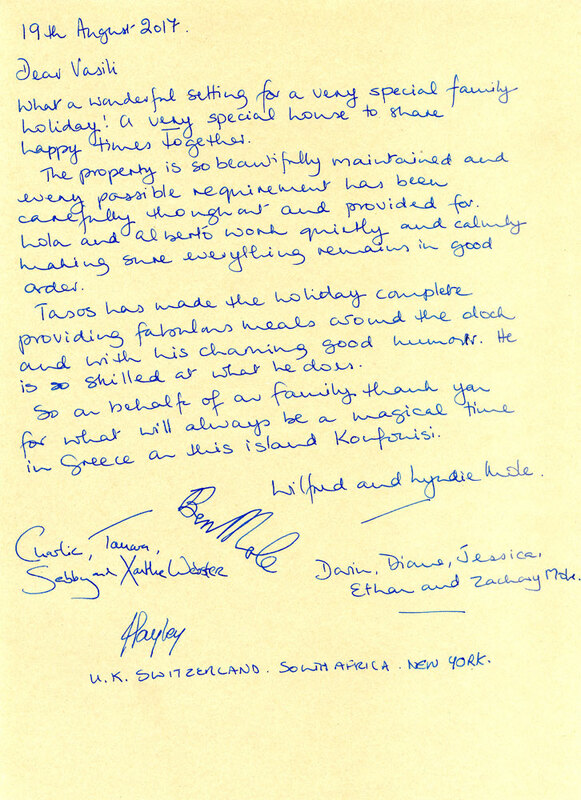 We would HIGHLY recommend anyone renting the property to use Tasos. The property itself is stunning, with views overlooking the Aegean and Koufonnisia's surrounding islands. The pictures don't even begin to capture the beauty. The bedrooms were perfect, the outdoor living and dining space is unmatched in any vacation home I have been in, and there are wonderful exercise, sauna, steam, and whirlpool facilities. The pool provided wonderful entertainment for both adults and children, and the beaches on the island made for truly perfect days on vacation. I cannot recommend this property more highly. 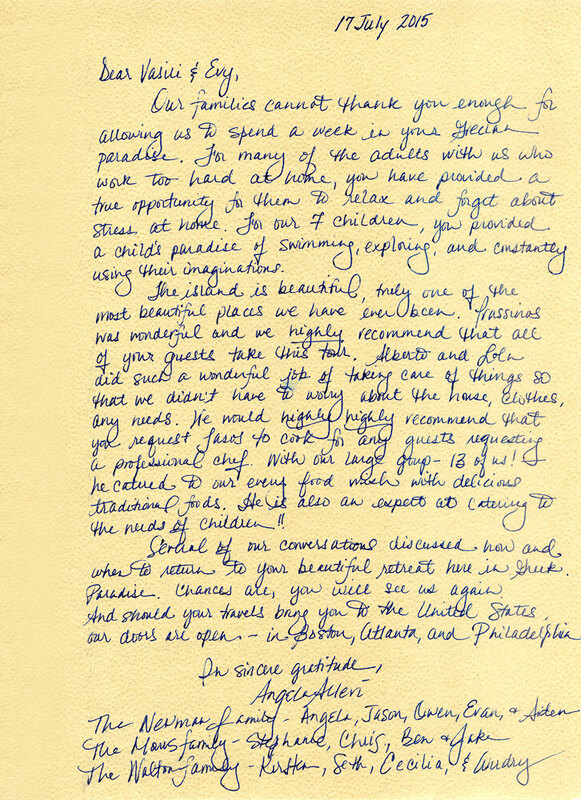 We were three families and on our return to the United States swiftly recommended to all of our friends that they stay here. 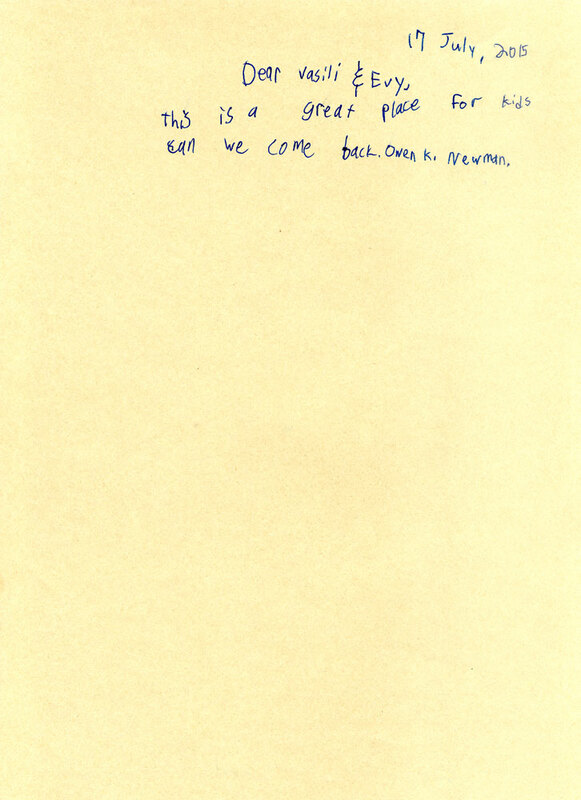 We hope to only be so lucky as to return here one day in the future. I'd never been to Greece before but was feeling really happy when we managed to secure this property. However, when we stepped off the ferry before even arriving at the villas we realised this was going to be far beyond what we had expected. The island is breathtaking - the small town and crystal clear beach were just the start. Greeted by the lovely, generous owner and driven to the villas our large group (7 adults and 7 children) were shown around the stunning, fully equipped homes and welcomed with devine local food and welcome drinks. We spent the next 8 days exploring the island using the cars available. Then returning home to our gorgeous villas which overlooked the island. Kids spent forever in the pool, spas and playing table tennis. Adults spent forever enjoying themselves, dining in various spots around each villa. Listening to music that surround the pool area. I cant speak highly enough of the property and the hospitality we were shown by the owners. We plan to go back again and would recommend this spot to anyone wanting a family and friends trip. Owner's Response: Dear Michelle, So nice to hear from you and specially read your lovely comment. 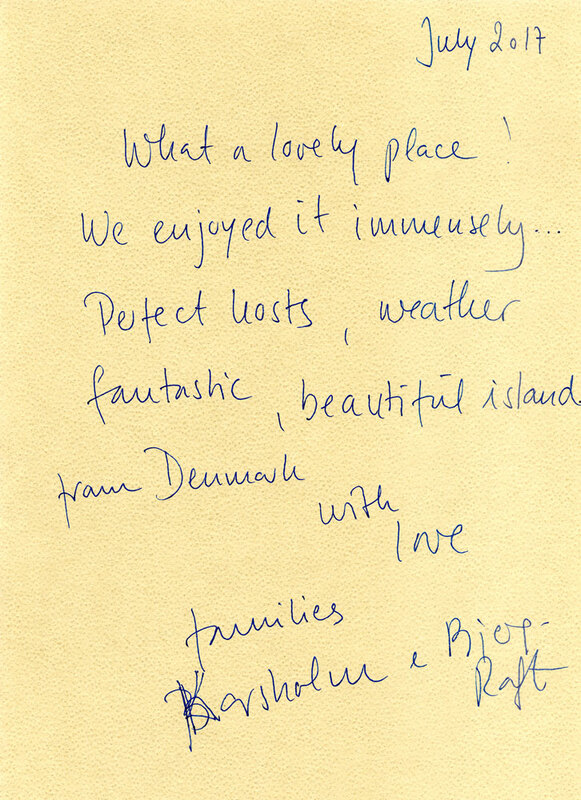 We are very pleased that you liked your stay at our villas so much. I hope you collected memorable moments and experiences which you'll share with your friends. We hope to see you again next summer Till then, have a great time! It's difficult to believe islands like this exist outside of postcards. Classic architecture with no modern development, secluded beaches and wonderful tavernas over looking them. These villas perched above the town and beaches are breathtaking and lack nothing. The view and the outdoor areas are more than enough to make you think you are in paradise, but saunas, hammans, gym, table tennis etc etc are the icing on the cake. The two cars are also a very welcome touch for young families (we were 14, 7 adults, 6 kids and a two month old baby). Perfection, it's not cheap but it is absolutely worth every penny. Thank you Vasilis. There are no words to describe these wonderful houses. They are located a few meters away from Chora, the main village of Koufinisi, on the top of a small hill. The view at Chora, the endless blue of Aegean sea and the surrounding islands (from any room or veranda) was just breathtaking. 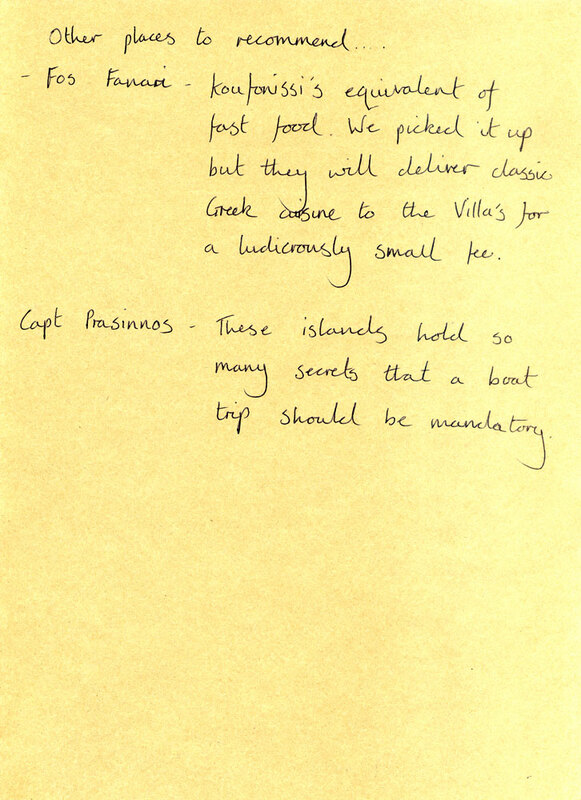 When we arrived at the island Vasilis welcomed us at the port and transported us to the villas. There we also met Evi and together they showed us around the houses and explained how to use the facilities. They treated us with local delicacies and they left an amazing food-basket for the upcoming days! How sweet and welcoming! The place they have created is so elegant and luxurious. Everything is taken care to the last detail. We enjoyed the harmony and comfort of the interior (totally aligned with the Cycladic architecture), the relaxing and playful moments by the pool, the extraordinary view from the verandas, the luxury of the spa area. The houses are surrounded by a beautiful garden which is worth exploring- there are different kinds of aromatic plants, few trees, flowers, two play areas and some hammocks. The kitchens were fully equipped with anything we could have possibly needed or even imagined. Albert and Lola were cleaning and maintaining the place on a daily basis. We were impressed by their discrete and polite presence. One of the reasons though this place will always stay in our hearts is because it accommodated one of the most beautiful moments of our life: our wedding. Organizing a dinner and a party for 100 people is not an easy task. It would have never been possible without the support of the owners, Evi and Vasilis. Six months in advance they provided us with the plan of the houses so we could make the arrangements of the dining tables, they brought us in contact with the person who installed the sound system in the houses to make sure we rent the extra sound equipment with the correct specifications, they allowed us to visit 3 months in advance to inspect and figure out our decoration plans. 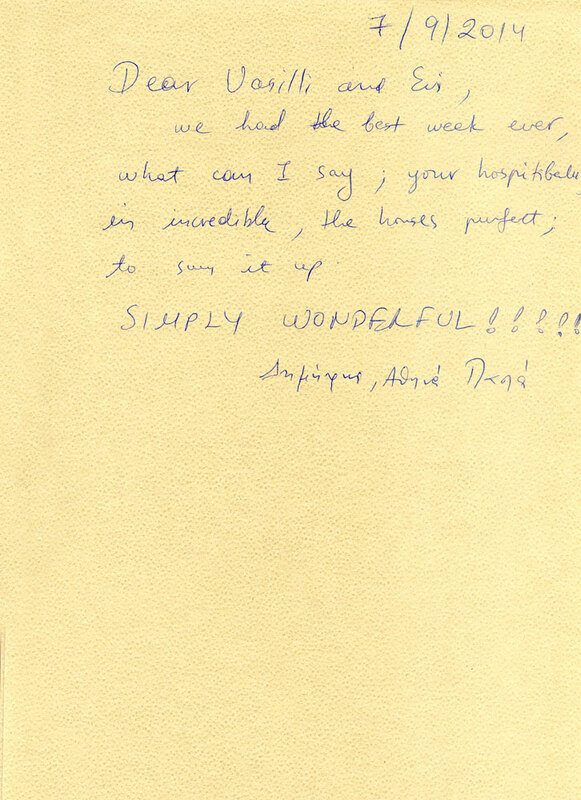 They have always been polite and very responsive to any e-mail we have sent them. I was really touched though by the way they wanted everything to be perfect for us and our guests during the wedding day. They payed attention to the correct lighting of the tables and made sure everything was running smoothly. Again their presence was extremely discrete. 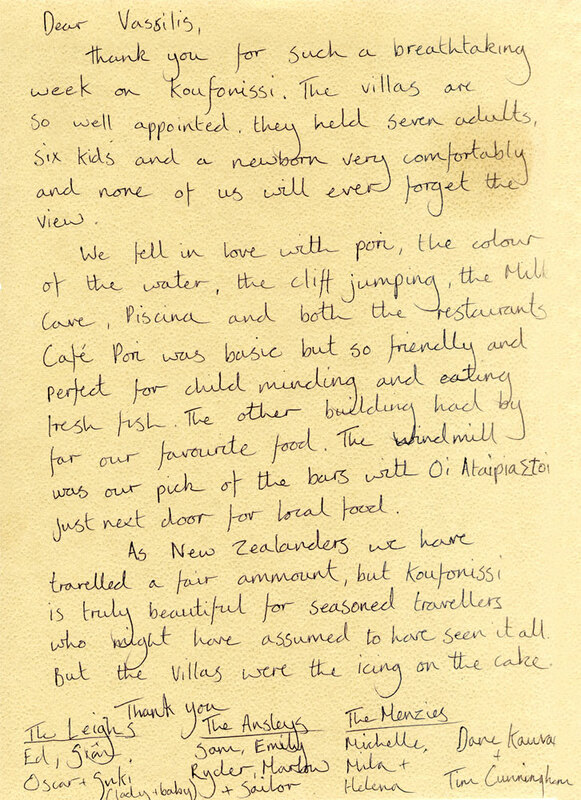 Evi and Vasilis thank you from the bottom of our hearts for this amazing experience. 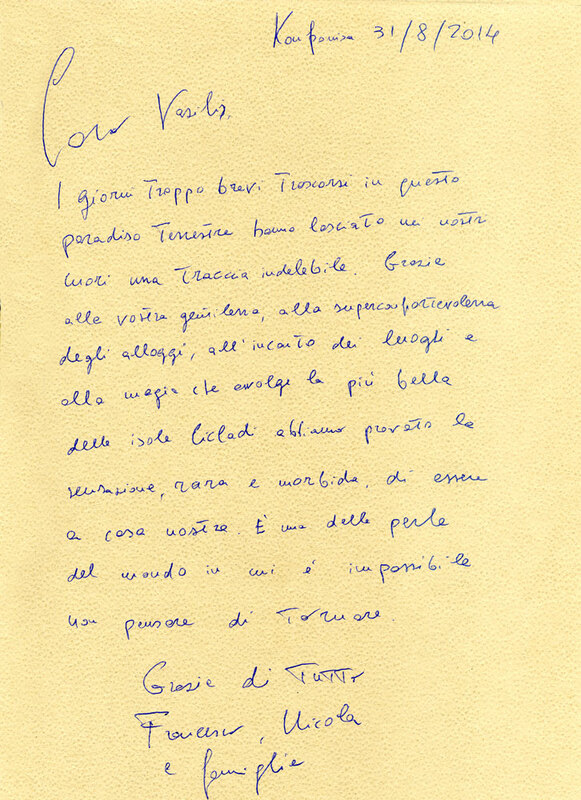 Owner's Response: Dear Maria, dear Giorgo, Thank you so much for this beautiful and so touching review. We really appreciate that in middle of so many obligations and preparations for your new life you have taken the time to write your thoughts. 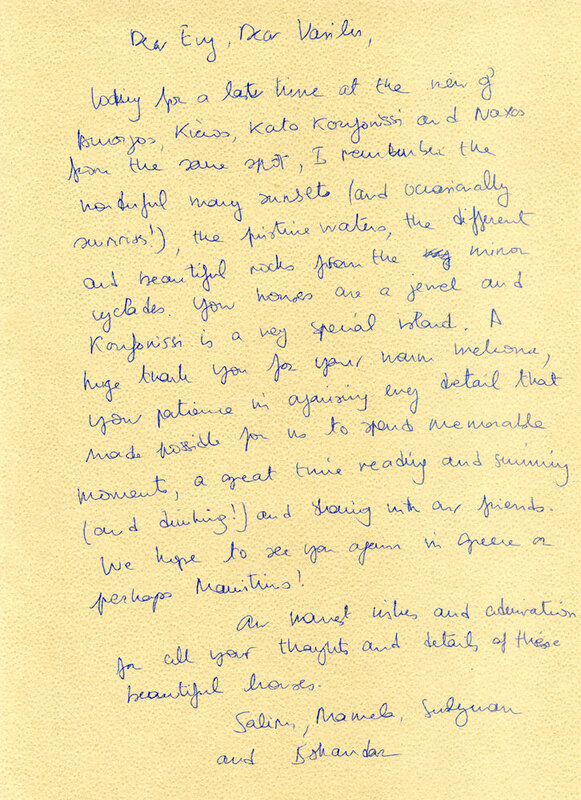 We are deeply pleased that you enjoyed your stay at our villas and liked all moments you spent there. 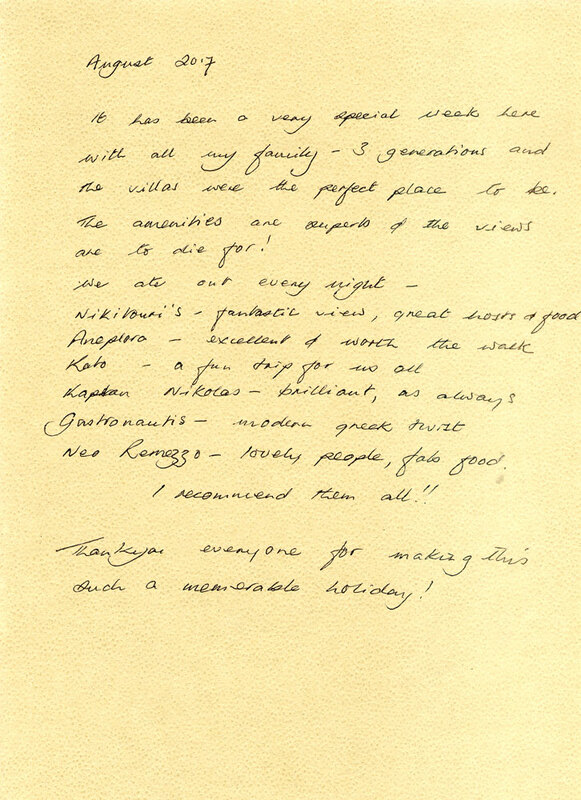 So nice to see that you appreciate all our work and effort to create this place of total relax and make your stay comfortable and unforgettable We would like you to know, that we also enjoyed your wonderful marriage and tried to do our best for your very special moment for which everything conspired to make it perfect. We wish you full of happiness in your family and every success at your professional life! We certainly look forward to welcoming you back to our villas. All the best! Vassili and Evy Note: Our subsequent clients greatly appreciated "Maryo" for which we heard that you also had a star on Great Taste Awards. Congragulations! As soon as you open conversation with the owners about a potential holiday, you will be hooked by their exception customer service and willingness to help (be it how to get there to actually booking tickets). It only gets better when you arrive at the island and welcomed by Vassilis. He sorted out all the baggage of our group (10 very appreciative people) and took us up to the Villas for a welcome reception. once you arrive at the Villas you are amazed at the stunning beauty of both the Island (amazing view) and the Villas. They had everything we could have possibly wanted and more. The Villas are just spectacular. A real great holiday feel and lots of places to relax and be alone, while also having some great entertaining areas. The pool was in constant use and the pictures do not do it justice. The Wood-fire BBQ was used to make some pizza's which was great fun. Spa, Sauna and Steam rooms in each villa are great and a nice way to finish the day. The Villas were maintained to an exceptional standard every day by their team. They went over and above and even helped out with laundry (we were running short at the end of our trip). 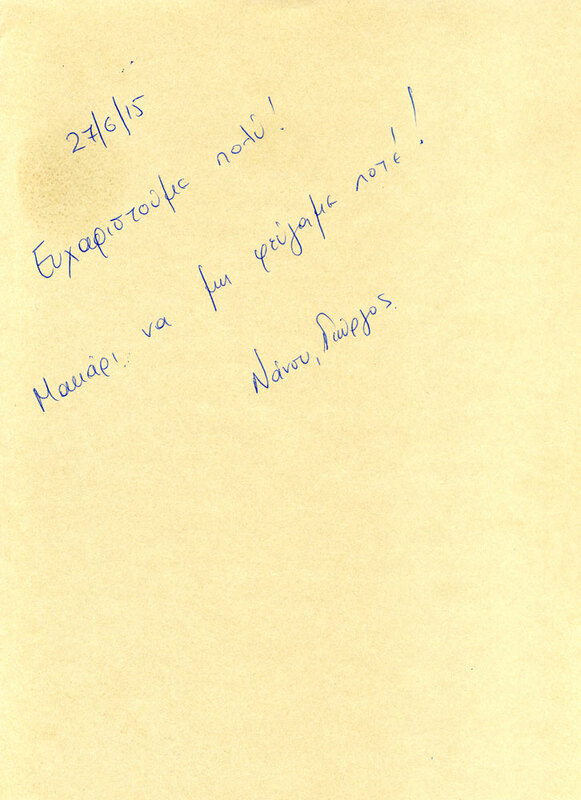 Vassilis was in constant contact and made sure that we had everything we needed. He introduced us to the locals around town and pointed out the best restaurants around town. Having the use of cars and bikes was extremely helpful and made the visit just the bit more amazing. overall, we had a absolutely amazing time here. We would go back in a heart beat and advise anyone else to do the same. A truly unique Greek experience and some of the best customer service I have ever experienced. 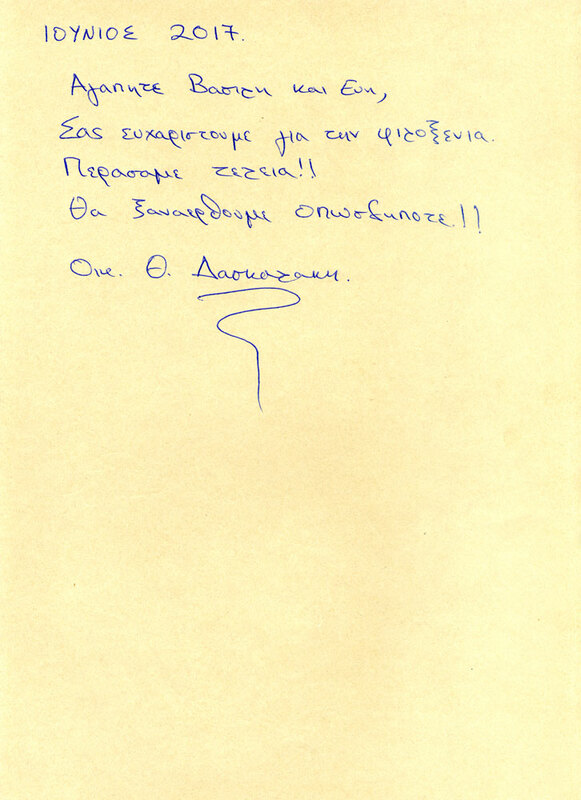 We have travelled around the Aegean many times, but it was the first time that we appreciated so much the “greek myth”. Visiting Koufonisi island last July was an experience that we have been keeping in our hearts – of course only until we repeat it! The place is a real paradise, a blend of crystal blue-green waters, golden sand and stunning views to the whole complex of Little Cyclades. 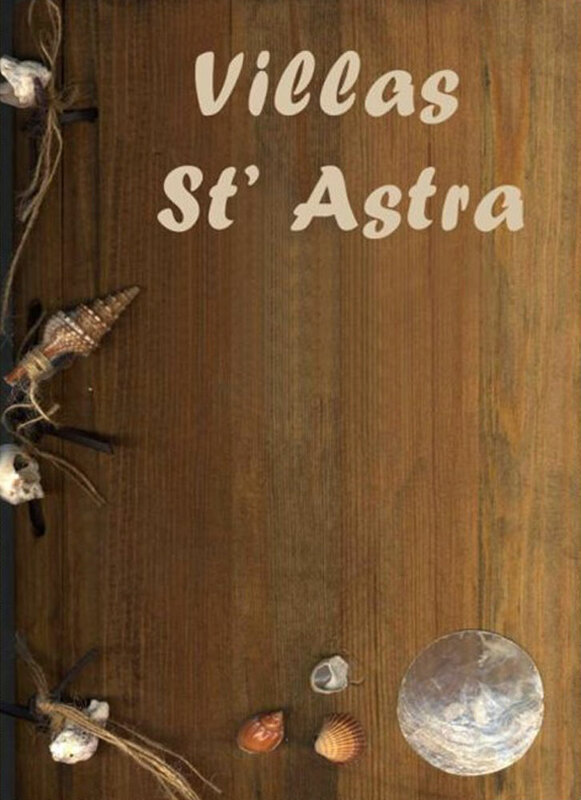 But our trip to the Island would never have been such an enjoyment if we had not discovered “St’ Astra” villas. The location is perfect, the view from the pool area and the garden, just to die for. We were a group of 12 friends – some of us singles, some with families and kids and we did not dare to expect that we could find a place to stay that it would manage to complete everyone’s standards and wishes. For the first time, this beautiful establishment kept as all delighted. The elegantly decorated, full equipped villas became our private wellness retreat. The managers, Vassili and Evi welcomed us with wine and fruit and made us feel at home right away. The breakfast time was a true ritual under the breeze of the large furnished verandas, while after visiting some of the best beaches in the world (we’ve been to Maldives three years ago, so we were difficult to impress), some of us preferred to relax at the swimming pool with a cold drink, while me and my wife loved to share a hamam, after an intense ping pong match with the kids. 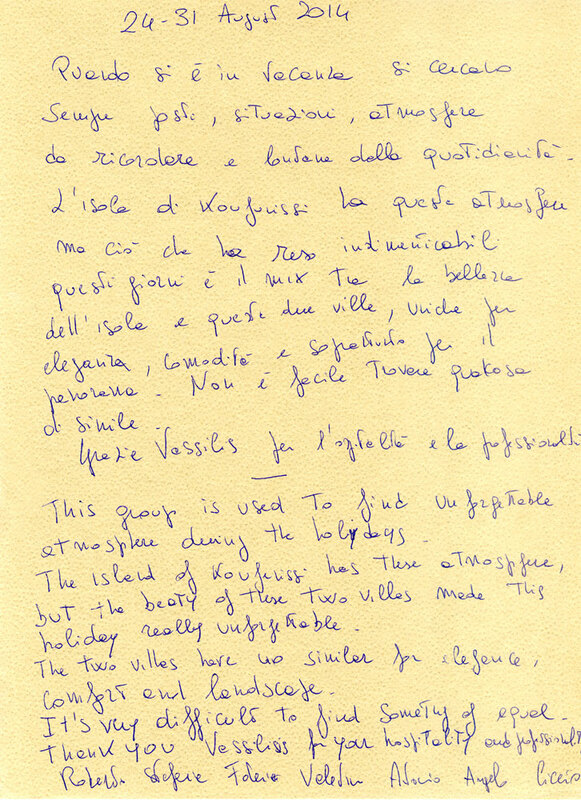 Vassili will be glad to help you discover the island with a lot of insider’s tips – the place is small, but really interesting and do not miss to pay a visit to Kato Kousonisi, a smaller island easily accessible by boat, where we tasted the most delicious bouillabaisse in our lives. Traditional cuisine and fresh fish is something that you will really appreciate if you take this trip. In the evening some of us tried the little cocktail bars of the village, but I’ d rather stay by the pool listening to favorite songs and enjoying the moon diving into the sea, after the great colours of the sunset and inhaling the smells of the garden herbs. From the villas you can also have the experience of a glorious sunrise –one of the group was a photographer and after showing us his pictures we understood why he kept getting up at dawn the whole week. It was the first time in my life that I felt like I wanted to write a poem, or a song. I am looking forward to feeling again this way and we’re planning to come back next year –hopefully with our new baby! We visited Koufonisi last year on July. Last minute decision but the best one! We were a group of 10 friends on this small island where we all agree that we had our best holidays. A good welcome with “rakomelo” from Vassili (the manager) signed our right choice. The villas are perfect, better than the photos. The service too! Very clean and well-maintained. Such a view! There was many times that I prefered stay there & relax at the pool or balconies comfortable sofas. So peaceful ! All bedrooms had sea view, I slept better than at home! If you know bout herbs, you’ll find many of them in the garden. Our omelets had tomatoes and peperoni we ourselves collected & cooked. It was the first time a had a “hamam” after my regular training at the gym. Great experience! The island is small but no way to get bored. Gold sand beaches, clean waters! The villa provides umbrellas for the beach. Don’t miss to rent the kaique for a tour in both Koufonissi islands. About food now: just delicious! We ate at Fos Fanari(try Stella’s pies), Pori sardines at the BBQ, Captain Nicolas (very famous), & fish soup on Kato Koufonissi(you have to order it earlier – Vasili did it for us).Ask him whatever you want, he’s always “there” for you. During the night we mostly prefered to stay near the poll but of course we didn’t pass over to visit the little town & islands bars. I really don’t forget this amazing week & hope to repeat it. Surrounding Area: Beaches and beach tavernas. Tips or Restaurants: Excellent ice cream shop at the top of the village. Overall: Our stay in Koufonissi was the trip of a lifetime, made possible not only by the villas Belus and Agenor but by their owners. Vassili and his wife Evy truly saw to every detail, not just in the homes but on our entire trip. We were picked up and taken to the port for travel, they arranged our boat tour with the famous Captain Prassinos, they provided us TWO cars for use during our stay (what other rental property does that? ), they made sure we knew where to go for a birthday cake for our son, and they provided recommendations on where to eat and where to purchase fresh fish. The caretakers of the home, a lovely couple, could not have been more wonderful and made sure that we truly didn't lift a finger during our time there. We hired a professional chef and Tasos made our stay just perfect! His food was truly amazing, and his ability to cater to 13 guests was unmatched. We would HIGHLY recommend anyone renting the property to use Tasos. The property itself is stunning, with views overlooking the Aegean and Koufonnisia's surrounding islands. The pictures don't even begin to capture the beauty. The bedrooms were perfect, the outdoor living and dining space is unmatched in any vacation home I have been in, and there are wonderful exercise, sauna, steam, and whirlpool facilities. The pool provided wonderful entertainment for both adults and children, and the beaches on the island made for truly perfect days on vacation. I cannot recommend this property more highly. We were three families and on our return to the United States swiftly recommended to all of our friends that they stay here. 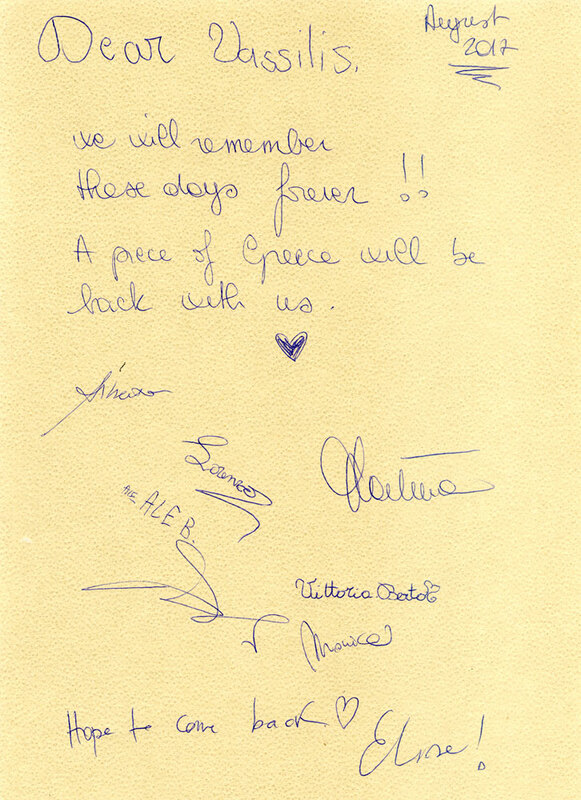 We hope to only be so lucky as to return here one day in the future. Surrounding Area: The views were STUNNING. The pictures don't even capture the immense beauty. The rustic mixed with the lure of the azure Aegean sea, truly Paradise. Nearby Events or Locales: The WHOLE island is within walking distance. If that wasn't enough, the owners provide you with a car in case you don't want to walk. Tips or Restaurants: You don't need anything. They have thought of everything. My only suggestion would be to rent this property!!! Directions: Not necessary. The owners pick you up at the port - how much easier could that be? Overall: This was truly one of the most spectacular vacations I have taken. Was there with a total of three families, several of whom were young children. The accommodations were perfect. Spectacular views, perfect outdoor space, and a beautiful house. It was wonderful having a pool, plenty of lounging space- both in the sun and shade, and all kinds of amenities. Enjoyed Most: The location of this property atop a hill overlooking the ocean and the town provided views that were a perfect backdrop for relaxing with a book, a drink, or for a swim in the pool. The setting was paradise. Enjoyed Least: That I had to leave after a week. Nearby Events or Locales: This house is walking distance to the beach, the town of Koufonisi, and frankly almost any of the island. Its not in town, but its a nice walk. The house comes with 2 cars- and getting around is quite easy. Tips or Restaurants: Vassili, the property owner.manager couldn't have been more accommodating. He picked us up from the dock, brought us to the house, and then took us on a quick tour of the island. 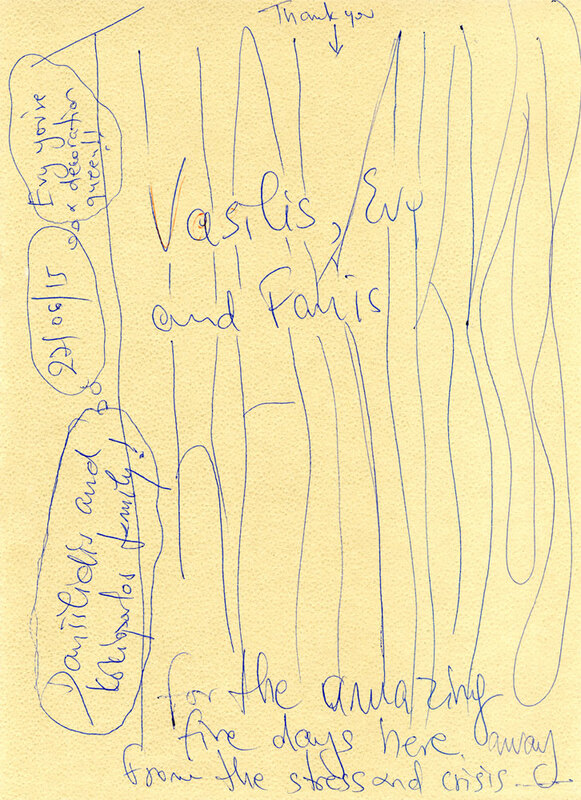 We were greeted as "friends of Vassili" everywhere we went. He knew all the restaurants, beaches, and other spots to hit. Perfect. Check In Out: It was effortless. We arrived at the port, all of our luggage was taken, and we were driven directly to the house. Overall: We could not imagine it to better than it was. Enjoyed Most: The large outdoor shaded seating areas with the stunning views of the Aegean Sea and the village. Surrounding Area: The picturesque village with all its restaurants. Nearby Events or Locales: A fifteen minute stroll downhill. Going back to the villas took a little longer. Tips or Restaurants: We visited many restaurants and they were all excellent. Some things are hard to find on the island, like fresh meat for barbecuing. Check In Out: The host made us feel extremely welcome and did a great job.